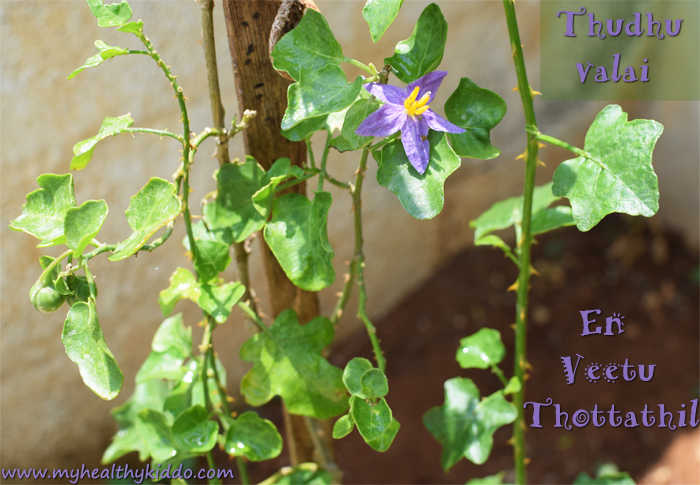 Thudhuvalai/Solanum Trilobatum is not only a medicine for cold, cough, asthma and other respiratory disorders but also to stay young and to extend our lifespan, is what Sidhars say!! This herb is specially recommended for dads-to-be, moms-to-be, pregnant ladies and lactating moms. Grow these herbs at home and add medicinal values to your food. My MIL makes this rasam whenever someone has cold at home. 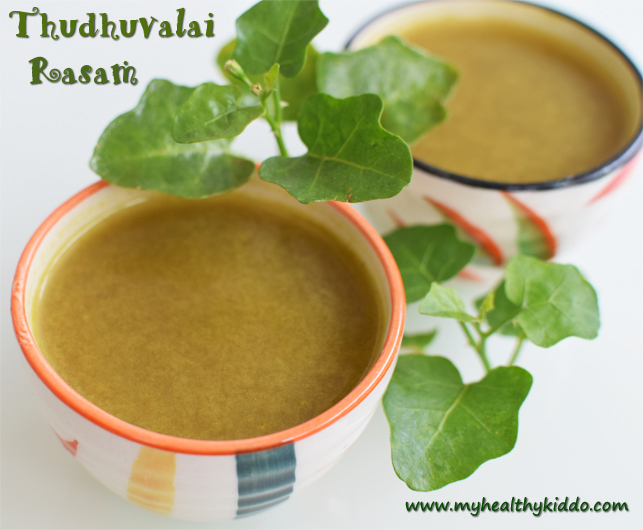 You can even buy Thuthuvalai powder from herbal shops and make this rasam. Below is the one from my kitchen [email protected] The green fruits will ripen to red. If you just squeeze some red fruits in a pot, you can own one..
1.Cut out 10 leaves and wash well. Soak tamarind in warm water and keep aside. 2.Grind cinnamon(pattai), cloves(kraambu), peppercorns(milagu), cumin seeds(jeeragam), small onions, garlic cloves, curry leaves, coriander leaves, turmeric powder and coriander powder. Add lil water and grind well. 3.In a mixing bowl, add ground paste. Rinse mixie jar with water and add that water too. Mash the soaked tamarind with fingers and drain that water to this mix. 4.In a pan add oil and once hot, add mustard. Once spluttered, add urad dal. Then add dry red chilli and curry leaves. In few seconds, add the rasam. 5.Add required salt and let it boil for 10 minutes. Do not cover with lid while boiling. That’s it.. Flavorful medicinal rasam is ready.. Have it with rice as rasam or just sip as soup !! Virgin coconut oil is recommended for this recipe. Click here to see how to make virgin coconut oil at home ? Thoodhuvalai plant will be full of thorns. Handle carefully while cutting the leaves. The green fruit can be added when rasam boils. Do not grind it as it will be so bitter. 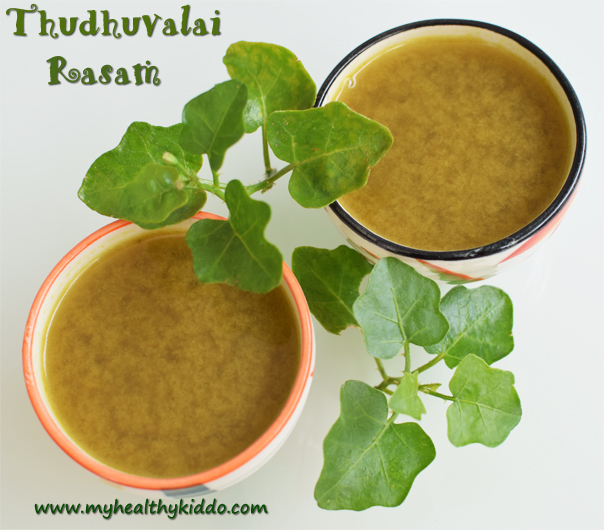 4 MusuMusukkai leaves can be added along with thoodhuvalai leaves for good relief from cold. If you don’t like the strong flavor of herbs, you shall fry the leaves in few drops of coconut oil to get rid of raw smell and then grind along with other ingredients.